WHAT IS YOUR FAIRFIELD HOME WORTH TODAY? Are you planing to Buy a Home in FAIRFIELD OR ROCKLAND? 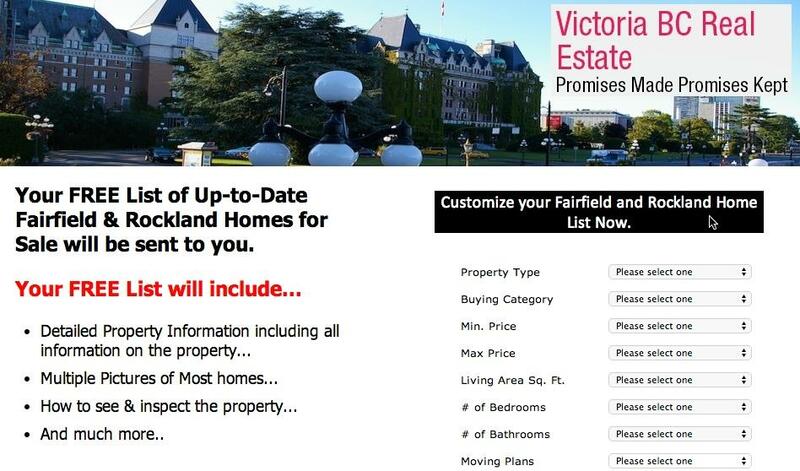 Then you have come to the right place..It's easy to find your next dream home in Fairfield, just fill in a few Questions to Find Fairfield and Rockland Homes and Properties in Victoria, BC like outlined in the Photo below and you'll soon receive a FREE current list of Homes and Properties For Sale throughout Fairfield and Rockland, BC. “The neighborhood of Fairfield British Columbia is a delightfully peaceful and prosperous alcove of the beautiful Provincial Capital City of Victoria. See her serene and stately streets stretch out for miles along the sparkling coast, and know that from wherever you are this is a home - and what a home!" -A verdant wilderness, a veritable cornucopia of ardent pleasure, calling out to you through the waves. As the Ceremonial Home of all British Columbians, Government House continues the long-standing tradition of honoring the contributions of our fellow British Columbians at this beautiful historic site. The House contains the Office of the Lieutenant Governor, the representative of Her Majesty The Queen of Canada, and offices of the administrative staff who support the duties and activities associated with the appointment. As an official residence and the Province's center of hospitality, accommodation is afforded to visitors that can include members of the Royal Family, international royalty, ambassadors, members of the judiciary and other honored guests of British Columbia. Although the Lieutenant Governor continues to maintain a private residence while in office, Her Honor stays at Government House when carrying out official duties. When she is in residence at Government House, the Lieutenant Governor's personal standard can be seen flying from the flagpole. Fairfield House at 601 Trutch St. -built by Joseph Trutch in 1862. The Ross Bay Cemetery take the virtual tour! is Victoria's premier house of the dead, were many of the city's founding fathers and mothers and other illustrious clients took a permanent vacation. It is named after Charles Ross, one of the Hudson Bay Chief Factor in charge of Fort Victoria. Opened in 1873 and gradually expanded to 27 acres to meet the needs of every given harvesting season - the wealth of statuary and the sheer expanse should tempt anyone for a visit. If that alone is not enough, there are also more species of pine trees in the cemetery than anywhere else in Victoria. It is recommended that you pay your respects on the night of a full moon with a single robe and a wand of incense. The tiniest park of all in Victoria is the Gonzales Hill Regional Park because the purpose of the park is to protect the Gonzales Observatory, which is now a Heritage building. Built in 1914 as an Astrophysical lookout point, it was adapted in the years to come to meet the expanding development of Victoria - The street lamps that this suburban growth brought with it acted as an astro-retardant, and the Observatory was turned into a meteorological station. Today, it is being used as an “atmospheric biogeochemistry research” facility funded by the University of Victoria. It is worth taking the hike up those stairs on Barkley Terrace just for the commanding hillcrest view, which panoramas Victoria. Meet Fred Carver Personal Real Estate Corporation RE/MAX Realtor, Specialist in Fairfield and Rockland BC home sales for over 40 years, Born and raised in Victoria, Fred knows Real Estate values and the best areas to live, like Fairfield and Rockland, BC. PLANNING ON SELLING YOUR HOME IN FAIFIELD BC NOW OR IN THE NEAR FUTURE? Maybe you just need to know What Your Home in FAIRFIELD is Worth in todays changing Victoria real estate market. IT'S EASY TO START... JUST CLICK ON THE "WHAT'S YOUR HOME WORTH?" GRAPHIC BELOW.THEN FILL IN THE QUESTIONAIRE. YOU'LL RECEIVE LISTINGS OF FAIRFIELD HOMES YOU ARE WANTING TO FIND. NOT LISTINGS YOU ARE NOT INTERESTED IN. Go to the Graphic above or web address below and fill in your Info on the type home you are wanting and the Fairfield Location in Victoria you would Like to live, include your price range. And a Phone where we can confirm your wish list.